Millésime [mill-ey-zeem] means vintage, the perfect name for a classic waiter-style corkscrew handcrafted by coutellerie Jean Dubost according to centuries-old tradition. The handle is of lustrous rosewood, the body the finest quality stainless steel hallmarked with the Laguiole bee. The choice for lovers of great wines for generations, it's an accessory du bar that makes an extraordinary gift. Crafted in France. Presented in a wooden gift box with a leather pouch. Is the screw teflon coated? BEST ANSWER: It doesn't appear to be teflon coated, but looks to be stainless steel. It is a beautiful corkscrew and works great. This was gift for my husband and he was thoroughly pleased. The screw in the Millesime Rosewood Laguiole Corkscrew is not teflon coated. Is this available with any customization, or a custom presentation box? I want a traditional, high end corkscrew as a gift, and I want it to be personalized. Gave it as a present to my husband. A little pricey for a wine opener of this type, but he is worth it. Easy to use and keep clean. A nice present for someone you care about or want to impress. It says it all. 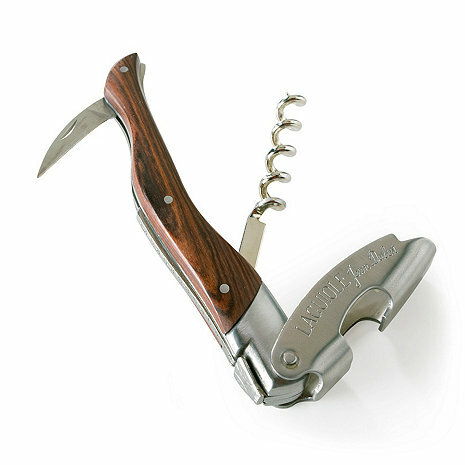 The Laguiole corkscrew is a well balanced, precision instrument and pleasure to use -- I would highly recommend for a wine aficionado as a gift.